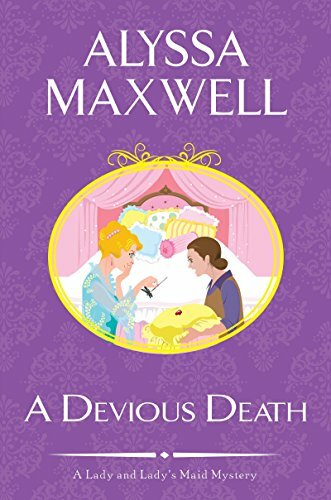 Alyssa Maxwell’s A Devious Death is the third in her A Lady and Lady’s Maid Mysteries. Set in England just after The Great War, her heroes, Lady Phoebe Renshaw and lady’s maid Eva Huntford tend to encounter murders and chaos with repeated regularity. Phoebe and her sister, Lady Julia, and their maids, Eva Huntford and Myra Stanley, have been invited to High Head Lodge, the new home of their cousin, Regina Brockhurst. Upon their arrival they meet Olive Asquith, Regina’s mysterious and rude friend. Regina informs Phoebe and Julia that they have a mission: to help renovate the old property and convert it to a modern art deco style building. It becomes evident to the sisters that their cousin has mysterious plans for the house, but what those plans are remains to be seen. Within a short time, the group grows in size when Regina’s mother, Clarabelle, and her brother Hastings and his wife Verna arrive in a whirlwind of anger accompanied by Ralph Cameron, their solicitor. It seems that their recently departed father stepped away from the norms of the day and left the bulk of his fortune to Regina instead of her brother. The weekend sets in, in a flurry of anger and claims and threats as Regina’s family sets about demanding she relinquish all claims and turn over the fortune to Hastings. That is not about to happen. The next morning when Regina is found murdered, the accusations begin to fly, and Phoebe and Eva set about to learn whom the real murderer is. They are assisted by Constable Miles Brannock, whose appearance in previous books has set the stage for a budding romance with Eva. Maxwell is skilled at presenting a variety of characters, each of which has the right motive to kill Regina, and yet the evidence is circumstantial, causing Phoebe and Eva to dig deeper into each person’s background. As they dig into Regina’s reasons for buying this particular house, they discover that there is a political issue—communism—lurking in hers and Olive’s background. Olive’s motive for killing Regina doesn’t add up, but Phoebe and Eva sense there is something more they are missing. As they look into the anger of the family, they uncover a multitude of issues beyond just family humiliation—Hastings has his military secrets as well as an addiction to ether; Clarabelle, upon losing the family fortune, has had to rent out the family estate and has no place to live; Verna has lost her place in society and until Hastings gets what she sees is duly his, she is the subject of gossip within her social circles. As the anger within the group grows and charges race around among the guests, Ralph Cameron, the family solicitor, tries without success to calm the group and get to the bottom of the crime. But Ralph has some information that he wants to share with Phoebe and he sends a note to her asking for a meeting. Someone intercepts the note, and Ralph is dispatched. In the meantime, Myra Stanley is proving to be less than a sterling lady’s maid when it is discovered that she sells information on the wealthy family she serves in order to improve her own coffers. Could she have been discovered by Regina, and thus the lady of the house had to be done away with? Another suspect enters the fray. Just when Phoebe and Eva are attempting to sort out a handful of suspects, two more enter the scene. A foreign couple, hired as cleaners, appear not to be what they seem, and they are quickly ferreted out as communist sympathizers who worked with Regina and Olive to establish a group whose goal is to recruit members. Maxwell ramps up the pace of the story with attacks on Eva, Olive’s escape from custody, the flight of the foreign couple, an attack on Constable Brannock, and a final attack on Phoebe as she discovers what Ralph Cameron wanted to discuss with her, and she unravels the identity of the real culprit. In addition to the mystery of the murders, and the lingering political conflicts, there is an additional level of conflict between Phoebe and her sister Julia that Phoebe needs to sort out. Maxwell provides a strong group of characters to pick and choose from, each with his or her own dysfunctional problems, making each an ideal candidate for the role of murderer. If there is one drawback, it is minor: Maxwell tends to throw many questions into her narrative, questions that distract the reader.